My alarm went off way to early this morning. I was really comfy and deep asleep. I had the instant urge to turn it off and sleep forever. However, a little kitten with a loud meow also heard the alarm and was not about to let me forget it. Snoozing is not snoozing with a constant voice outside your door, so I let her in for a cuddle before finally dragging myself out of bed. Despite being tired, I wasn’t about to miss this morning’s outdoor run. A quick look at my phone confirmed that it was indeed 40 degrees at 6:15AM. By the time I hit the road at 6:45, the sun was starting to rise. I hit the trail which was a mix of melted snow and ice. It was kind of like doing intervals as I walked across the slippery ice. I was so excited to be back outside and it felt almost like spring. I had a few quick minutes to shower and get ready for work. I was actually excited for my lunch today, so much more fun than my usual PB&J. 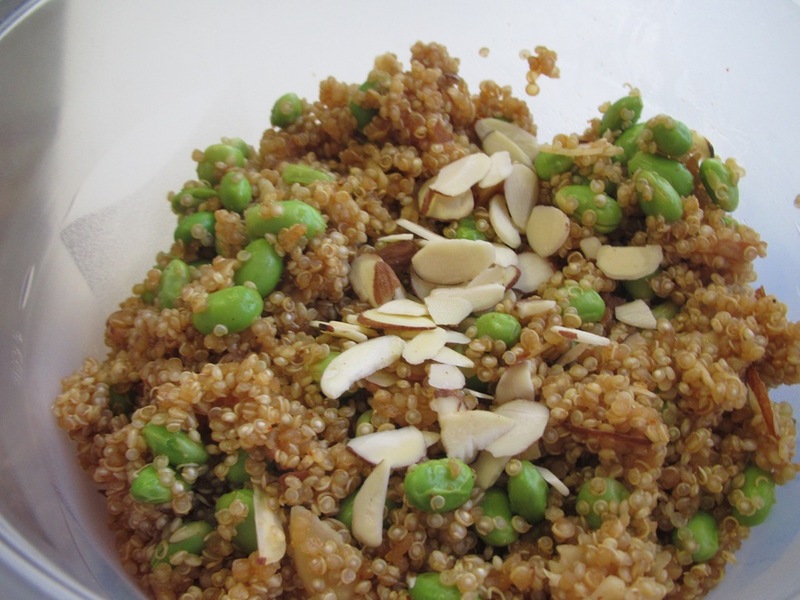 Yesterday, I made this quinoa and edamame salad from Oxygen Magazine. I subbed in veggie broth for the carrot juice (because believe it or not, carrot juice is kind of hard to find). The salad turned out amazing and it is PACKED with protein. Here is the recipe from Oxygen. I added in some chili powder too. 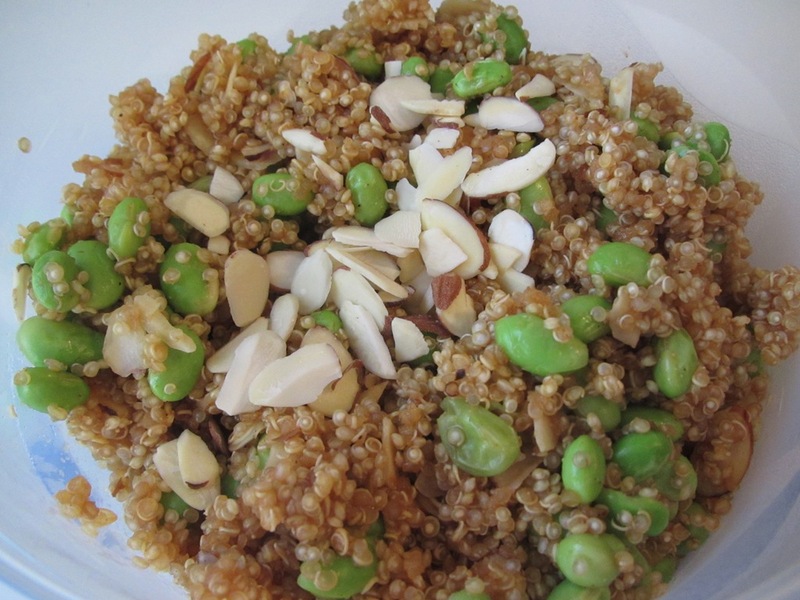 Just make the quinoa and then stir in the other ingredients. Dried cranberries would be a good addition too. To go with my salad, I made Mama Pea’s Mmmm Sauce. I have read about the sauce on tons of blog, but never thought to try it. It was super easy to make and the perfect addition to my salad. The sauce stores in the refrigerator for a week and can go with anything. Once you try it, you’ll totally understand! I packed my salad and sauce with a pita for lunch today. I must say that this lunch was real good, a definite repeat. I shared some of the sauce with my vegetarian coworker. She ate hers with pasta and veggies and was a big fan too. No pictures from the lunch table today because I’m not sure how I would explain that one to my coworkers. What fun recipes have you been making for lunch? Anyone been out running and enjoying this ‘heat wave’? Every Monday as the BOY heads off to school, he asks me what I’m going to do with my day off. Typically the answer is ‘Monday Things’ which means a workout, trip to the grocery store (or two), laundry, and in today’s case, finally organizing the pantry. He also knows that Mondays involve some quality time in the kitchen which usually results in a homemade dinner for him. I tend to save some of the more time consuming recipes for Monday when I have the time to shop in the morning and then prepare dinner while I catch up on trashy TV (ie today I got to watch Kim and Kris’s relationship dissolve) and fold laundry. Tonight’s menu…lasagna and tagine. An odd combination, I know. While I don’t make a habit of cooking two separate dinners, I knew that the BOY really wanted a lasagna, and I have never liked lasagna. Instead, I went with another recipe that I found in Vegetarian Times that looked good and would provide plenty of leftovers for the week. 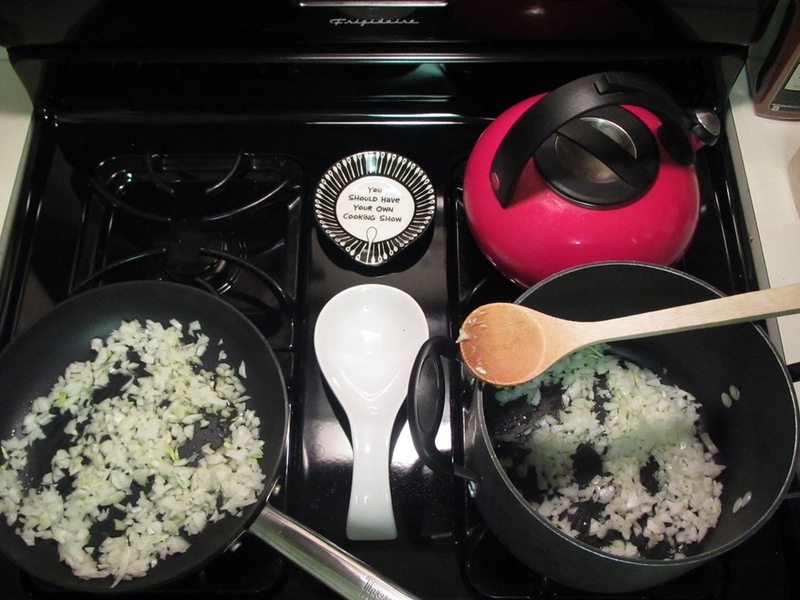 They began very similar…oil, onions, and garlic, but went two very different directions. The first time that I made lasagna, I went looking for a high quality recipe to WOW the BOY and show off my culinary talents. While living in the south, I learned that they KNOW how to do comfort food, so Southern Living was the obvious place to look for your classic lasagna recipe. The recipe calls on simple ingredients to make a complex Italian style meal. The only negative is that it takes a little bit of time (over an hour) between making the meat sauce and baking the lasagna. The results are worth the wait, and if you don’t believe me, you can trust the BOY who was raving about his dinner tonight and agreed that this definitely makes the list of his favorites. Because he is the only one who eats the lasagna, I make half the recipe and use a smaller dish. This helps cut down the time which is a bonus. My other option is that I randomly give out lasagna to my family and friends, but I didn’t have any plans this week, so I opted for the half recipe, which works out great. 1. Sauté onion in 1 Tbsp. hot oil in a large skillet over medium-high heat 5 minutes or until tender. Add garlic, and sauté 1 minute. Add beef, and cook, stirring occasionally, 10 minutes or until beef crumbles and is no longer pink. Drain beef mixture, and return to skillet. Stir in diced tomatoes, next 4 ingredients, 1 tsp. salt, and 1/2 tsp. pepper; bring to a boil. Reduce heat, cover, and simmer, stirring occasionally, 30 minutes. Remove and discard bay leaf; set meat sauce aside. 2. Place lasagna noodles in a 13- x- 9-inch pan. Carefully pour 8 cups boiling water and remaining 1 Tbsp. olive oil over noodles. Let stand 15 minutes. 3. Stir together ricotta cheese, eggs, Parmesan cheese, remaining 1/4 tsp. salt, and remaining 1/4 tsp. pepper until blended. 4. Spoon half of the meat sauce mixture in a lightly greased 13- x 9-inch baking dish. Shake excess water from noodles, and arrange 6 noodles over meat sauce; top with half of ricotta mixture and 1 package mozzarella cheese slices. Repeat layers once. 5. Bake, covered, at 350° for 55 minutes. Uncover and bake 10 to 15 more minutes or until bubbly. Let lasagna stand 10 minutes before serving. Garnish, if desired. I’m sure the BOY was getting a little tired of the meatless meals and was thrilled to have a tummy full of meat and cheese when he sat down to do his homework tonight. For my dinner, I made a tagine that I had cut out from December’s Veg Times. This recipe has fewer ingredients and is much sweeter than other tagine’s that I have made. I followed the directions, but after adding the lemon juice and dates, I let the stew simmer on low heat for ~45 minutes (while the lasagna finished up). This made my chickpeas softer and really allowed the flavors to blend. If you are looking to decrease the sweetness, then add fewer dates. One online reader suggested adding kale, which I will definitely do next time. I served my dinner over whole grain couscous with some green veggies on the side. This recipe comes together easily in one pot, and it was much more filling than I expected it to be. Use it as your main dish or a side with pork chops. It will make great leftovers throughout the week. 1. Heat oil in saucepan over medium heat. Add onion, and cook 10 minutes, or until starting to brown, stirring often. Stir in garlic, cumin, coriander, ginger, and cinnamon, and sauté 30 seconds. Add tomatoes, chickpeas, and 1/4 cup water; simmer 10 minutes. 2. Meanwhile, toast couscous in small saucepan over medium heat 5 minutes, or until fragrant. Add 13/4 cups water, and bring to a boil. Remove from heat, cover, and let stand 5 minutes. 3. Stir dates and lemon juice into tagine, and season with salt and pepper, if desired. Serve over couscous, sprinkled with cilantro. As I was making the White Chocolate Puppy Chow for today’s work party, it got me thinking about what I made last year for the winter party. Another winter white chocolate dessert, these indulgent Cranberry Bliss Bars, based on the Starbucks bars. The fresh ginger is the place to start and adds the perfect amount of zing. It nicely compliments the white chocolate and dried cranberries in these cakey bars. The bars are drenched in cream cheese frosting, which adds the perfect amount of sweetness and topped with even more cranberries and a white chocolate drizzle. Absolute perfection! I must confess that I have never tried this Starbucks sweet, but I’m betting these are just as good. Preheat oven to 350 and lightly grease a 9×13 pan. Beat butter and sugar together for the cake base, and add eggs/vanilla beating until fluffy. Sift together flour, ginger, and salt and then add to the butter/sugar mixture beating well. Fold in the cranberries, chocolate and ginger. Spread thick batter in pan and bake for about 20 to 25 minutes or until light golden. Most of my Sunday Fundays involve some combination of football and beer, so I am sure you are thinking that I am very confused (and a week ahead) with my Superbowl Sunday post. I am not! What can be more fun and exciting than football and beer on Sunday??? This event held at the Rosemount Convention Center was Friday, Saturday, and Sunday. Rumors were circulating about crazy lines and waits (apparently last year in Canada the line to get in was 6 hours long). I was debating if I wanted to check it out. On one hand, I wasn’t in the mood to fight other yogi’s for capri pants, but I am a sucker for a sale and I do LOVE Lululemon. I had a work party for our patients and their families this morning and by the time it was over at 1:00, I had recruited two friends to swing by the sale with me. The convention center was packed and it almost reminded me of the Chicago Marathon Expo but not actually that crazy. After parking and wandering through the convention center looking for the sale, I was beginning to wonder if it was worth it. 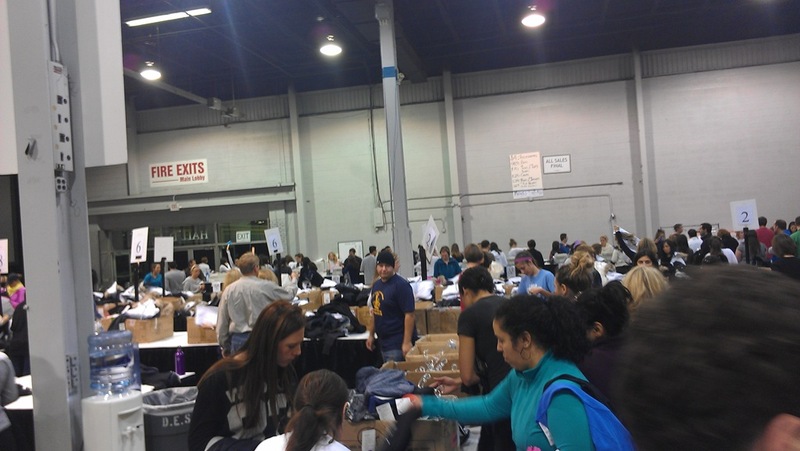 We checked in our coats and purses, held onto our wallets and phones and walked into a huge warehouse covered with bins and racks of clothes arranged by size. Music was blaring and people were dancing and performing yoga. As we danced our way in, I knew that it was totally worth it! The prices were hanging overhead. Being the last day of the sale, the racks were obviously picked over (especially in some of the smaller sizes), but there were still plenty of options to sort through and try on. There was a line for the dressing room, but it moved quickly. I didn’t know what to expect, but walked into a large communal room with my arms full of clothes surrounded by half naked woman hovering around mirrors. Luckily, my friends had gotten a prime spot. There is nothing like a cozy dressing room to help you make new friends. With sizes being scarce, there was lots of back and forth and sharing and digging around in the dressing room bins. 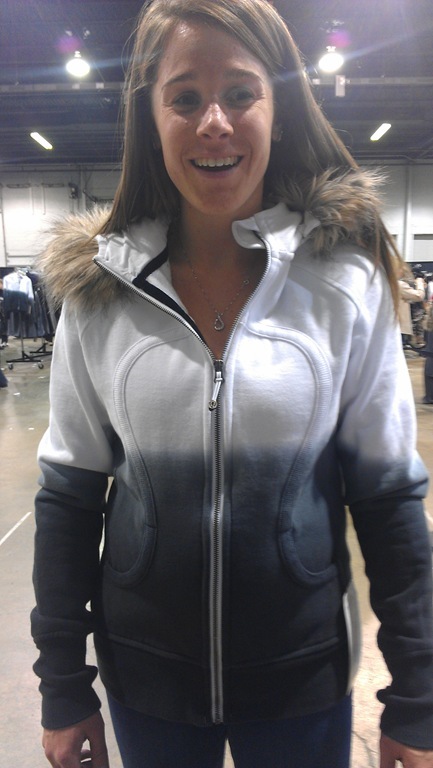 While we were trying on clothes, an announcement was made dropping fur hoodies to $29 and stating that all sizes 10 and 12 were buy one get one FREE. I grabbed the pile of clothes that I liked and headed out to find some more tanks and goodies for my mom. My friends were ready to go, but I had one last decision to make. What color did I want for my FREE (I was already getting one for my mom) hoodie. Since I didn’t want to wait in line again for the dressing rooms, I made a new friend who took my picture to help me decide. I wasn’t planning on actually posting the pics but thought they would be good for a laugh. I went with the pink one so Mom, just a heads up…we have matching hoodies (don’t worry the fur zips out). I made my way over to the long line to check out, super excited about my purchases. And snapped some photos while I waited. The last line was to get my purse and jacket back before working my way through the maze of the convention center, paying for parking, finding my car, and eventually the highway that takes me to my house. Man, shopping can be exhausting! I made it home with two full bags of clothes (including my mom and my matching hoodies). I’m so excited to wear all my new workout clothes, which will look even cuter knowing that I got them all for a steal. Now tell me THAT is not a great way to spend a Sunday!!! Did anyone else make it to the sale this weekend? What did you think? Since the BOY and I were total bums last weekend, I insisted that tonight’s date night involve leaving the house. There are a few movies out that we want to see, but the times didn’t work. We went back and forth about what to do and finally decided on going out for dinner. I have been talking about sushi since our new friends in St. Kitts recommended a Chinese/Japanese place nearby and it was easy to get a reservation this afternoon. We drove 10 minutes down the road to TL’s. The restaurant was busy, always a good sign, and the food looked amazing. The menu was full of options ranging from Chinese food to sushi. The TV flashed pictures of some of the specials and although the Chinese food looked fresh and delicious, I had to feed my sushi craving. I ordered a glass of Argentinian Malbec, and the BOY ordered an Asian beer. We started with an octopus salad which was and spicy and fresh. For dinner, I ordered a special roll called the Snow Angel (I thought this was fitting for the winter weather) that had avocado, crab, eel, and salmon, and the BOY and I split a BBQ eel roll as well. We were both really happy with the sushi that we ordered and it really was a great meal. I can’t wait to return to try some of the Chinese dishes. When we got home, we decided to play a game. The BOY through me for a loop by suggesting LIFE. I can’t say that I have played this game since I was a kid and even then we used to just drive the cars around the board and collect people. I was really more of a Sorry or Trouble fan. While we played, the BOY and I snacked on the White Chocolate Puppy Chow that I made for my office’s Family Winter Party tomorrow. One of my coworkers suggested that I make it again after my Treat Day because it looks like snow. And the BOY declared it absolutely addicting (and I must say I agree)! At the end of the game, I had a husband, no kids, a luxury car, and a yacht. Doesn’t that sound like fun?! I’m a bit sore after my double WOD this morning and happy with my sushi-filled tummy. I guess it’s time for bed. Another Saturday, another car full of ice and snow. At least this week, the sun is shining, which makes me much happier! My first Workout of the Day (WOD) was scraping ice off the 6 windows of my car, which proved to be quite an arm workout. The term WOD is a CrossFit term used to explain the prescribed workout for that day. For those of you not familiar with CrossFit, it focuses on using varied, functional movements at a high intensity that are adjustable to ANY fitness level (Source). The days accomplishments are often based on time and posted for the group on a white board. It is an up and coming workout that is becoming super trendy right now. Reebok has just become the national sponsor. People who do CrossFit swear by it and report good results. Just a side note, many of the CrossFitters that I know also follow a Paleo Diet. I have been reevaluating my current gym situation. There are not group classes that fit into my day during the week and I am not a fan of the overcrowded weekend classes. I thought CrossFit would appeal to my competitive side and wanted to check it out. A friend recommended her gym which does a free trial class on Saturdays. Although it is not in my neighborhood, I ventured out this morning to check it out. The gym is a large industrial looking no-frill room with lots of CrossFit-specific equipment. We started with a 15 minute warm up written on the white board geared to work strength, range, and balance. The CrossFit people say that their warm up is other people’s workout, and I can see why. After the warm up, we split up. There were 4 of us doing the free trial and the rest of the group went into their WOD. We got some interesting background on CrossFit and how this specific gym trains. Then we did an 8 minute workout consisting of 10 squats, 8 situps, and 6 squat to ceiling arm raises with a huge medicine ball. The goal is do as many sets as possible in 8 minutes. We used chalk to keep track of our reps with check marks on the floor. The workout was challenging, but I did pretty well. We finished with some assisted pullups. I was slightly disappointed that we didn’t do a full out workout, but I was happy to learn a little about how CrossFit works. The people were super friendly and welcoming, and I ended up chatting with a few of them before I headed home. I was really impressed with the gym and the people. I’m not sure I will be able to fit a weekly CrossFit class into my schedule (mostly because of the location and the fact that some of the classes start at 5:30AM), but if it were in my backyard, I could see myself as a regular. The sun was shining when I got home and although my phone said it was cold, I decided to try out a snowy run. I have been wanting to get my feet back into these waterproof trail shoes and today seemed like a good day to try it. I headed out to the trail which was covered in a thin layer of snow. The trail was quiet and the trees were beautiful. Even with the sun shining, I started off chilly. I warmed up quickly, enjoying the quiet forest and bright reflection of the sun on the snow. Four miles later, I walked in the door and was immediately greeted by the kitten. I thought she was happy to see me, but really, she just wanted to eat some of the snow off of my shoes. 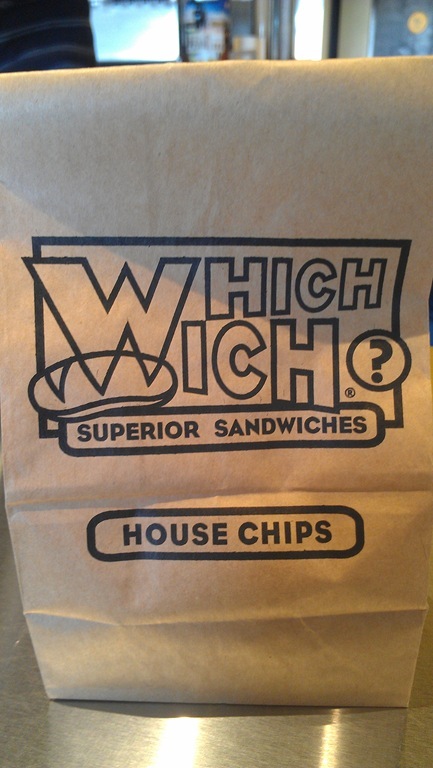 For lunch the BOY and I went to check out a new sandwich place in town called Which Wich?. They have a creative way of ordering and a variety of vegetarian sandwiches. Each sandwich has a brown paper bag. Using a sharpie you fill in all the details of how you want your sandwich made (white or wheat bread, cold or hot) and any extras that you want. I ordered a tomato and avocado sandwich (a rare option that happens to be one of my favorites) with hummus and mushrooms. The BOY was happy with his Italian sandwich with a side of homemade chips. My warm and toasty sandwich was delicious and full of avocado. The hummus was a fabulous addition. There aren’t many places that have hummus as an option which is one of the reasons that I am now a HUGE fan of Which Wich? The BOY and I both agreed that this is a place that we will come back to. If there is one popping up in your neighborhood, you should give this unique sandwich shop a try. What was your Saturday WOD??? Doesn’t that sound like the tag line on the cover of a magazine? That’s exactly what I was thinking when I wrote it! But I decided, as I was running on the treadmill this morning, that since I haven’t done an exercise post in awhile, I was due for one. And since this is an exercise post, it’s a good time to share the results of my Push Up Challenge. I wanted show up in the Caribbean this month with strong, toned arms, and get motivated to strength train throughout the winter, so I set out to do 50-60 pushups in a row. I accomplished 45 plank style pushups, no rest, and felt confident wearing all of my sleeveless tops on vacation. To show you, I made the BOY take these goofy pictures of me (in the comfort of our room away from the public eye). Although we’re in the midst of a winter ‘heat wave’ here in Chicago, it is still too dark in the mornings to go running (trust me on this one…I check the sunrise times on Google every week). I burned tons of calories and got in a good workout in a short amount of time. Last night, I was flipping through February’s Oxygen Magazine. This is not a magazine that I typically read, but someone had given it to me. Once you get past all of the protein supplement ads and bodybuilder models, it actually has some interesting information for beginners as well as advanced athletes. The magazine also had some interval plans for your next treadmill workout. I have to admit, that I usually do a 1:3 ratio of burst/recovery and was shocked to see that they recommend the opposite. I chose the workout below for this morning’s run and didn’t even realize it was for beginners until I just snapped this picture. I alternated between 7.0/8.0-8.2mph aiming to keep my heart rate in the high 150’s during my recovery and above 170 during my burst. The run was quick, leaving me enough time to get in some abs before work. But the best part was that 36 minutes whizzed by. Before I knew it, my workout was over! How do you beat workout boredom? HIIT is known to fry calories in a shorter amount of time, improve your cardiovascular health, and prevent workout boredom, so give it a try. You can use any piece of cardio equipment. Start with one of these ideas or create your own, making sure that you push yourself into zone 3 (if you have a heart rate monitor) or to the point where it is difficult to speak more than 2 words without taking a breath. Enjoy! Spring will be here before we know it! There are a few different sciencey kind of theories at work here. Are you looking for more information and advice about exercise and exercise science? Can you find your Target Heart Rate? Do you want to know how? I have found that a little bit of knowledge and a heart rate monitor will change the way you train, making you more efficient and help you reach your goals. So if you’re interested, I’m happy to share what I’ve learned! Just let me know in the comments below!